Christina J. Paez and Len Kravitz, Ph.D. Article Reviewed: Ross, R., Freeman, J. A., & Janssen, I. (2000). Exercise alone is an effective strategy for reducing obesity and related comorbidities. Exercise and Sport Science Reviews, Vol. 28, No. 4, pp. 165-170. It is estimated that 55% of the adult population in the United States are either obese or overweight (National Institutes of Health, National Heart Lung, and Blood Institute, 1998). Obesity substantially increases an individuals risk of suffering from chronic diseases such as hypertension, coronary artery disease, and diabetes. Those with excess fat in the abdominal area are at increased health risk (National Institutes of Health, National Heart Lung, and Blood Institute). In an attempt to define the role of exercise in the treatment and prevention of obesity, the American College of Sports Medicine (ACSM) held a scientific roundtable to address this subject. Following the meeting, several consensus statements regarding physical activity and public health were released. Two statements are of particular interest to the applied exercise professional. The first statement declares that the addition of exercise to a diet with restricted caloric intake promotes fat loss, while maintaining fat free mass. The second statement claims that physical activity, without caloric restriction, minimally if at all affects fat loss. The statements suggest that to optimize weight loss, a combination of diet and exercise is best, and that exercise alone will not suffice. Although it is well established that a regimen of diet and exercise is the best way to control body weight, a recent review by Ross, Freeman, and Janssen (2000) challenges ACSMs statement that exercise alone is not an effective method of weight loss. This review suggests that the studies this statement was based upon do not effectively compare caloric restricting programs to increased energy expenditure programs. They conclude that if these factors were equal, exercise alone can be as effective as caloric restriction for weight loss. The purpose of this article is to present Ross et al.s argument contrasting the ACSM consensus statement. In their review, Ross et al. (2000) report that few randomized control trials equally compare diet only to exercise only weight loss programs. For example, in a twelve-week study, Hagan, Wong, and Whittam (1986) compared the amount of weight lost through diet only to the amount of weight lost through an exercise program. The obese women and men in the diet only group (n=24) that reduced their caloric intake lost 5.5 kg and 8.4 kg, respectively. To achieve this degree of weight loss, women decreased their average caloric intake by 945 kilocalories a day while the men decreased their average intake by 1705 kilocalories a day. The exercise only group (n = 24 obese men and women), performed a 30-minute walk/jog program 5 days/week. On average, the women expended 190 kilocalories per session while the men expended an average of 255 kilocalories per session, which resulted in a total weight loss of .6 kg and .3 kg for women and men, respectively. The women in the diet only program decreased their body fat from 35% to 29%, where as the women doing exercise only went from 35% to 33% body fat. Additionally, the men in the diet only group decreased body fat from 26% to 21% where as the exercise only group experienced no change in their body fat. This study clearly illustrates that weight loss through diet only was not equated to energy expenditure through exercise only. Therefore, equal amounts of weight loss should not be expected. In contrast, Sopko et al. (1985) in a twelve-week study, with obese men, reported that when the negative energy balance created by diet only and exercise only are equal, the two treatments produce similar results. The participants in the diet only group (n=10) experienced a weight loss of 6.1kg by restricting their caloric intake 500 kcal/day. The exercise only group (n=6) lost 6.2 kg by performing a treadmill walking program in which they expended 500 kcal/day. The men in the diet only group went from a body fat of 31.4% to 25%, where as the exercise only group went from 26.7% to 19%. These results show that equivalent amounts of weight loss can be obtained when the energy expenditure from exercise is similar to the amount of calories restricted through diet. This is contrary to the results of Hagan et. al., as well as the ACSM consensus statement that exercise without caloric restriction minimally affects weight loss. 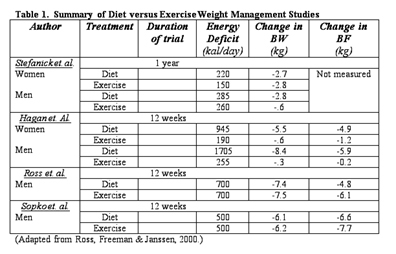 Table 1 summarizes some diet versus exercise weight management studies, further validating when energy expenditure is matched, weight loss is similar. Excess fat in the abdominal area independently increases an individuals risk of insulin resistance and high blood lipids. This distribution of body fat is also a strong predictor of cardiovascular disease (Grundy et al., 1999, National Institutes of Health, National Heart Lung, and Blood Institute, 1998). It has been shown that weight management programs resulting in a loss of total body fat also reduce a persons amount of abdominal fat. This loss of abdominal fat is associated with a decreased risk of cardiovascular disease. However, it has been shown that exercising individuals, who do not experience any overall weight loss still decrease their risk of suffering from cardiovascular disease (Ross & Janssen, 1999). The current research suggests that exercise without weight loss is actually linked to reductions in visceral fat (Ross & Janssen 1999). In two similar studies, Ross et al. (2000) and Sopko et al. (1985) showed that exercisers who did not lose weight experienced improved insulin sensitivity and an increase in their helpful HDL cholesterol. These findings are important because in the event that weight loss is not achieved, a person who is at increased risk of coronary artery disease (CAD), or its comorbid conditions (i.e., high blood pressure, glucose intolerance, insulin resistance), still benefits from regular aerobic exercise participation. Grundy, S.M., G. Blackburn, M. Higgins, R. Lauer, M. Perri, D. Ryan. Roundtable Consensus Statement: Physical activity in the prevention and treatment of obesity and its comorbidities. Med. Sci. Sports Exerc. 31: S502-S508, 1999. Hagan, R.D., S.J. Upton, L. Wong, and J. Whittam. The effects of aerobic conditioning and/or caloric restriction in overweight men and women. Med. Sci. Sports Exerc. 18:87-94, 1986. National Institutes of Health, National Heart, Lung, and Blood Institute. Clinical Guidelines on the Identification, Evaluation, and Treatment of Overweight and Obesity in Adults: The Evidence Report. Obes. Res. 6(Suppl 2), 1998. Pate, R.R., M. Pratt, S.N. Blair, W.L. Haskell, C.A. Macera, C. Bouchard, D. Buchner, W. Ettinger, G.W. Heath, A.C. King, et al. Physical activity and public health. A recommendation for the Centers for Disease Control and Prevention and the American College of Sports Medicine. JAMA. 273:402-407, 1995. Ross, R., and I. Janssen. Is abdominal fat preferentially reduced in response to exercise-induced weight loss? Med. Sci. Sports Exerc. 31: S568-S572, 1999. Ross, R., J.A. Freeman, and I. Janssen. Exercise alone is an effective strategy for reducing obesity and related comorbidities. Exerc. Sport Sci. Rev. 28: 165-170, 2000. Sopko, G., A. Leon, D. Jacobs, N. Foster, J. Moy, K. Kuba, J. Anderson, D. Casal, C. McNally, and I. Frantz. The effects of exercise and weight loss and plasma lipids in young obese men. Metabolism. 34:227-236, 1985. Stefanick, M.L., S. Mackey, M. Sheehan, N. Ellsworth, W.L. Haskell, and P.D. Wood. Effects of diet and exercise in men and postmenopausal women with low levels of HDL cholesterol and high levels of low-density lipoprotein (LDL) cholesterol. N. Engl. J. Med. 339:12-20, 1998.